Sandbags have long been used for a variety of stage purposes; most often as a portable and adjustable counterweight method for hemp rigging. 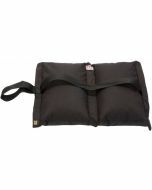 Sandbags are also frequently used to weight floor plates for stage bracing and to secure scenery or props. These sandbags, made in the U.S.A., are carefully rated for the weight of sand they will hold. They are made from strong canvas, reinforced with a sling, and equipped with a heavy metal hook and safety catch. Sand is not included. All sewn seams are stitch type 301 per Federal stitch standard No. 751a, and all seams are constructed using nylon V-T-295 thread, per Mil-T-7807. 2.15" x 4.5" x 12"